When fall rolls around we are all drawn to pack away our spring colored home accessories and pull out the browns and reds but this season, lets try something new! Try out this versatile and beautiful color- "beeswax". This yellow tone falls in between the yellows and oranges, near the color of those vibrant yellow fall leaves. It is reminiscent of the 70's but being used today in fresh ways, making it one of the season's most popular go-to colors. 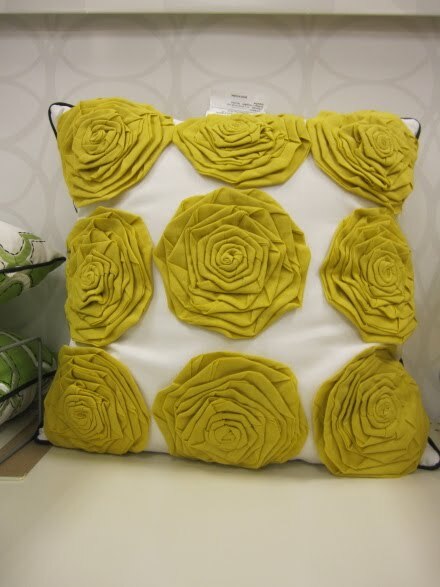 This pillow is a beautiful example of how to use this color- just a splash here and there. The color and texture of this pillow would go great just about anywhere. Designed by dwell studio at a Target price, it's an affordable and easy way to bring the luxe textures and colors of fall into your home without it looking seasonal.